1. tense, nervous, or irritable. Magnolia Sargentiana was named after Charles Sargent, the Director of the Arnold Arboretum. It was discovered by Ernest Wilson in 1903 in the hamlet of Yin-Kou, in the western Sechuan province of China. On a second expedition in 1908 Wilson collected the seeds of this variety, Magnolia Sargentiana var robusta. Magnolia Sargentiana var robusta Chenault at High Beeches Gardens was blown over in the great storm of 1987. It still flowers every year, and looks absolutely spectacular in early April. There are many different gardens hidden away in Battersea Park, each with it's own particular history. The recently developed Winter Garden has a wide variety of trees, shrubs and perennials, the Old English Garden tucked away by the cricket pavilion, the charming Rose Garden, the restored Russell Page Garden and the Sub-Tropical Garden. The Park has over 4,000 trees, many of which date back to the original layout in 1858 - Tom Maxwell has created an informative guide to the trees. It is a lovely place for an afternoon roam away from the city bustle, and there is much to discover. The landscape designer Russell Page's original Festival Gardens were designed for the 1951 Festival of Britain. A green lawn and colourful flower beds were surrounded by a children's zoo, model railway and a funfair. Twenty thousand yellow tulips along with raised beds of crimson and pink floribunda roses were planted and regularly changed from spring bulbs to summer bedding. The Festival Gardens were restored in 2004. The Sub-Tropical Garden was originally created by John Gibson in 1863 and were the first of this kind in the country. Gibson had been sent to India by the Duke of Devonshire to hunt for orchids and his journey took him via Madeira and South Africa. Using the plants he brought back from this trip, he created a unique garden at Battersea, made up of exotic plants and colourful 'carpet' bedding. During World War II much of the park became allotments to help feed local people, however in 1992 a palm tree was once again planted in this area, and they were restored to the original plans in 1992. Dress: French Connection; Handbag: Lauren by Ralph Lauren; Shoes: Elia B.
Photographed at Battersea Park, London. Gravtye Manor is the former home of the gardener William Robinson, author of The English Flower Garden and The Wild Garden. Robinson introduced the idea of naturalised planting – the concept of allowing nature to flow in the garden, challenging the usual practice of planting formal gardens with set borders.Robinson, who bought the manor in 1884, put his wild gardening theories into practice in the garden and many of his naturalised bulbs can still be seen today. The more formally arranged flower garden surrounds the manor, with the wild garden spreading out from the edges, including the orchard and meadow. Since 2010 the aim has been to both conserve and re-create Robinson’s work as well as progressing the garden, in homage to his style.At this time of year the contrast of the burnt orange helenium ‘Sahin’s Early Flowerer’ sitting alongside the white romneya coulteri ‘Californian Tree Poppy’ is really charming. The Kitchen Garden is a wonderful sight, with all sorts of exciting fruit, vegetables and herbs being grown, which are all used in the kitchen and served in the restaurant.The garden has such character and whether you are sitting in the formal garden having afternoon tea, or taking a stroll further afield after lunch, it is a really special experience. Green dress: Vintage Gina Fratini; Shoes: Office.Pink dress: Topshop; Shoes: Elia B.Photography: Sarah BrayPhotographed at Gravetye Manor. 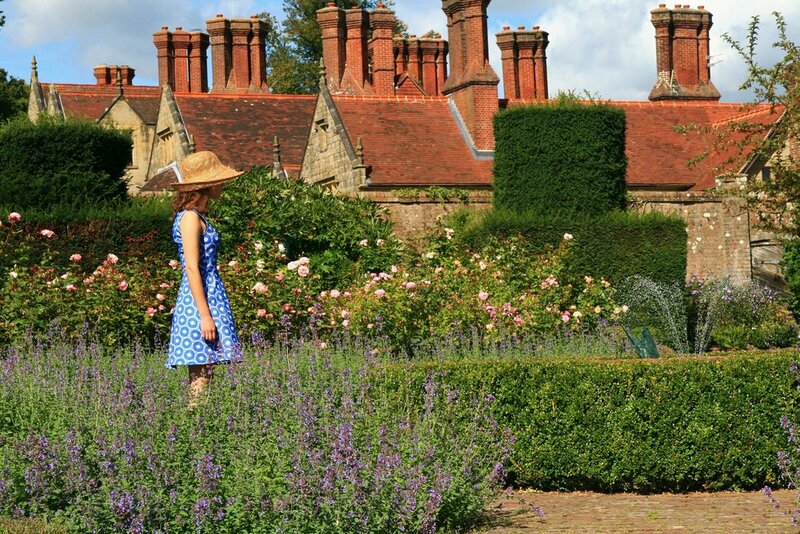 Borde Hill Garden in West Sussex was created in the 1900s and surrounds a striking Tudor Mansion built in 1598. The garden is perfect for an afternoon stroll with each area of the garden designed in a unique style. The Rose Garden close to the house is particularly attractive at this time of year, boasting over 100 varieties of David Austin roses which sit prettily alongside the blue nepeta. The peaceful Italian Garden is perfect for quiet reflection. The formal lay-out, with a pool at the centre surrounded by pots of agapanthus and geraniums is offset by a view out over the surrounding countryside.